COLUMBIA, SOUTH CAROLINA – Though everyone at the law firm of Callison Tighe takes pride in being a straight shooter, staff member Carli Cochran has honed her skills to world-class levels. A rising star in the international archery world, Cochran competed this summer in the SoCal Showdown USA Team Qualifier in Chula Vista, California and several other national events. 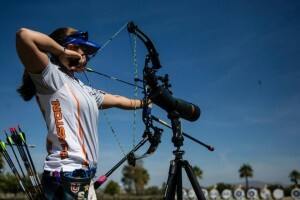 The showdown was the third US Archery team qualifying competition of the year. Cochran finished fourth in a 27-woman field in compound bow. Cochran, a past member of the US Junior National Team and a current member of the U.S. Senior National Team, made her World Cup debut last summer, winning three team silvers and one team gold. Individually at the Shanghai, China World Cup she competed against a two-time world champion in the bronze medal match. She’s also among only nine certified Level 3 archery coaches in South Carolina. That means she has the credentials to work with individuals rather than just teach in group settings or classes. At outdoor tournaments such as this summer’s, archers shoot 72 arrows at 55 yards to qualify. Then they compete in head-to-head double elimination matches of only 15 arrows each. She took up archery at age 14 and started hunting with her father. Her passion grew, and a year later Cochran competed at her first tournament. Seven years later, she has learned a lot about archery, competition and, most of all, focus. After traveling the world for the last few years, Cochran came to South Carolina in January 2014.